Your ankles: the workhorse joint of your lower leg, and all-but-forgotten until you injure it. Then you’ll be very well aware of it, and in a hurry to return your ankle to its former health! This time of year with ice and snow on the ground, you can easily end up with one of the most common ankle injuries: an ankle sprain. We give you the scoop on ankle sprains – from what it means, to what to do if you think you’ve sprained your ankle. If you sprain your ankle, you’ve moved your foot beyond its normal range of motion and stretched the ligaments of your ankle beyond their normal length. How severe the injury is depends on how many ligaments are injured and how badly they are damaged. There’s a 1-3 scale of severity with 1 being mild, 2 being moderate, and 3 being severe for sprains. You can suffer from an acute sprain, which happened recently and is healing, as well as a chronic sprain in which symptoms persist longer than normal healing time, and unfortunately a recurrent sprain that can occur easily and often with minimal force required. How common are ankle sprains? According to the American Physical Therapy Association, every day over 25,000 people sprain their ankle. 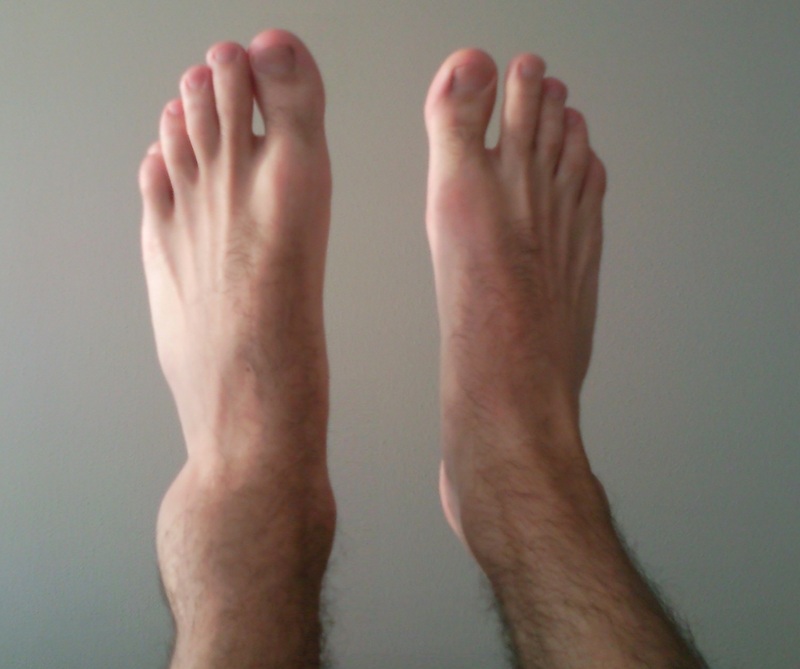 You may have swelling, pain/discomfort, limited range-of-motion, and/or ankle instability. How Does this Injury Happen? You can sprain your ankle in any number of ways, from playing sports like football or basketball, to slipping off a curb, to twisting your ankle on a hike. Some sports carry a higher risk, like those that often have fast changes of direction, impact, and/or jumping like football, soccer, basketball, and even volleyball. Unfortunately, you don’t have to be an athlete to sprain your ankle – sometimes you just have to be unlucky. If you think you’ve sprained your ankle, you can try conservative at-home treatment with RICE: rest, ice, compression, and elevation. A physical therapist is the ideal resource for helping you recover from your ankle sprain, as well as helping prevent future ankle issues. Your physical therapist will work with you to develop a treatment plan that may include strengthening and range-of-motion exercises, balance training, as well as show you proper form for activities and sports, and more. You’ll learn what may contribute to a higher risk of ankle injury as well as how to minimize your risk. Your physical therapist will help you reduce discomfort and strengthen your ankle and supporting muscle groups. In the case of chronic/recurrent sprains, you’ll learn how to reduce the risk of further damage and how to improve your condition. If you’re limping or limited in sports, activities, or life because of your ankle (or other joint or issues of the musculoskeletal system), don’t wait – call Body One Physical Therapy today. Locally owned and operated, Body One has four locations serving Central Indiana so you can find one that fits your schedule: North Indianapolis, South Indianapolis, Fishers, and Zionsville. Our talented, caring physical therapists work with clients of all ages and activity levels and they’d love to help you, too. Don’t let your injury hold you back, call Body One today and let us help get you moving in the right direction!